Not to be confused with Proof (rapper). Jacob "Jake" Anderson (born April 29, 1984), better known by his stage name Prof, is an American rapper, singer, and songwriter based in Minneapolis, Minnesota. He released his first full-length album, Project Gampo, in 2007 and has since released three additional albums and three EPs. In 2012, City Pages named Prof on their list of Minnesota's 20 best rappers. A co-owner of Stophouse Music Group, Prof signed to Rhymesayers Entertainment in late 2013. Jacob "Jake" Anderson was born in Minneapolis, Minnesota, and grew up in the city's Powderhorn neighborhood. His mother, Colleen, had a rocky relationship with his father (who suffered from bipolar disorder and was physically abusive) whom she would later divorce and move away from, taking Anderson's three older sisters with her. In his teenage years, he developed a "comedic, dirty-mouthed rap persona" he named Gampo after a childhood friend. Anderson graduated from Minneapolis South High School in 2002. 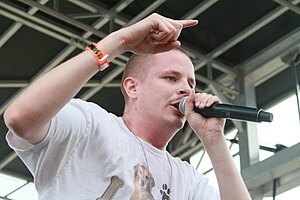 In 2010, Prof was part of Rhymesayers' Welcome to Minnesota tour. During the mid-2000s, Prof regularly performed at the Dinkytowner bar, giving "drunk show[s]" with partner and hype man Rahzwell – which meant beginning their set only after Rahzwell had vomited from every shot and beer that the duo received from the members of the audience. It was at one such show that Prof would meet his manager, Mike Campbell. Prof and Campbell, along with Dillon Parker, later became co-owners of the Stophouse Music Group, a record label that owns and manages their eponymous Stophouse Studios in northeast Minneapolis. The staff of City Pages named Prof as Minnesota's 19th-best rapper in 2012, citing his musical dexterity, "his impressive singing voice", and his ability to engage and make audiences laugh. Conversely, musician and critic Dwight Hobbes of the Twin Cities Daily Planet asserted that Prof's 2011 album, King Gampo, was "asinine, narcissistic self-indulgence run completely riot, without a shred of redeeming artistry" and "rap at its worst". Prof has been noted as one of the few Minneapolis rap acts (in addition to Doomtree and several Rhymesayers artists) who are capable of selling out the city's famed First Avenue Mainroom, and the only to do so in recent years without the backing of Minnesota Public Radio station 89.3 The Current. In May 2013, when Busta Rhymes failed to show up at the Soundset Music Festival in Shakopee, Minnesota, Prof substituted for him with only an hour's notice. On December 3, 2013, Prof signed to Rhymesayers Entertainment. The announcement video featured the label's co-founder, Slug, and coincided with the release of a single called "The Reply". The Star Tribune reported on the occasion that Prof would release another album in 2014. In a May 2015, Prof announced his debut record on Rhymesayers, entitled Liability. In the same interview, he also revealed he had signed with William Morris Endeavor for his future touring ventures. Prof released a single called "Ghost" from the album. Liability was released October 16, 2015, and peaked at 141 on the Billboard 200 chart November 7, 2015. On February 20, 2018 Prof announced he would be releasing a new album, titled Pookie Baby, on April 13, 2018. All albums up to 2013 were released by Stophouse Music Group. Liability and Pookie Baby were released by Rhymesayers Entertainment. ^ Prof's 27th Birthday and More! (Short). Minneapolis: Stophouse Music Group. May 4, 2011. Retrieved August 31, 2014 – via YouTube. ^ Prof (April 29, 2013). "Happy birthday to the most injured man in rap, PROF!". Facebook. Prof. Retrieved August 31, 2014. ^ a b c City Pages staff (May 25, 2012). "Top 20 best Minnesota rappers: The complete list". City Pages. Archived from the original on September 3, 2014. Retrieved August 5, 2014. ^ a b c d e f Fischer, Reed (April 9, 2013). "Off the deep end with Prof". City Pages. Archived from the original on July 29, 2014. Retrieved August 5, 2014. ^ Riemenschneider, Chris (April 11, 2013). "3 serious sides to Prof". Star Tribune. Retrieved August 31, 2014. ^ "Prof". Stophouse. Stophouse Music Group. Retrieved August 31, 2014. ^ a b c Riemenschneider, Chris (December 3, 2013). "Prof joins Rhymesayers as only Prof can do". Star Tribune. Retrieved August 5, 2014. ^ Hobbes, Dwight (September 5, 2011). "Prof's "King Gampo" is rap at its worst". Twin Cities Daily Planet. Retrieved August 5, 2014. ^ Riemenschneider, Chris (April 12, 2013). "Getting naked with Minneapolis trash-rap king Prof". Star Tribune. Retrieved August 5, 2014. ^ Diep, Eric (December 3, 2013). "Prof Signs To Rhymesayers Entertainment". XXL. Retrieved August 5, 2014. ^ a b Fischer, Reed (May 22, 2015). "Prof Releases Title and Date of Rhymesayers debut". Go 96.3. Retrieved May 22, 2015. ^ Maxwell, Ryan. "Prof ft Tech N9ne – Ghost". Hip-Hop Kings. Hip-Hop Kings. Retrieved 17 August 2015. ^ "Prof (5)". Discogs. Zink Media, Inc. Retrieved August 5, 2014. ^ Fischer, Reed (September 26, 2012). "Prof drops Kaiser Von Powderhorn 3 mixtape (Download)". City Pages. Archived from the original on October 19, 2014. Retrieved August 5, 2014. This page was last edited on 5 February 2019, at 02:15 (UTC).